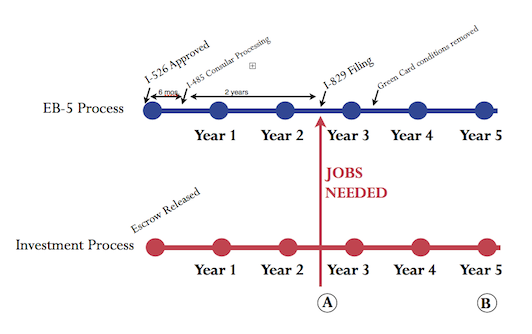 Relationship between job creation and return of EB-5 investment principal. This is a common question asked by prospective investors stemming from confusing the immigration process with the investment process. While the EB-5 investor is investing in order to obtain a greencard, legally, the two are separate processes. 3) the I-485/consular interview process is completed in 6 months. In theory, there are four different outcomes in a “loan-based” EB-5 process. Note, again, that this is assuming that the EB-5 investment is a loan-based investment and not an equity based investment. Please bear in mind that this is a simplified scenario. In real life, the lender’s interest is likely to have been secured so the Regional Center will look to enforce its security interests. Also, as mentioned in the assumptions above, the timing can be off if the Regional Center waits for other I-526s to be approved before making the loan. Furthermore, the USCIS has indicated that even if the jobs have not been created yet, they will look to see if the jobs “can be expected to [be created] within a reasonable period of time.” Suffice it to say that in the legal world, “reasonable” is a double-edged sword: it can save you or open up a huge can of worms.